This is yet another of Master Box's interesting sets. 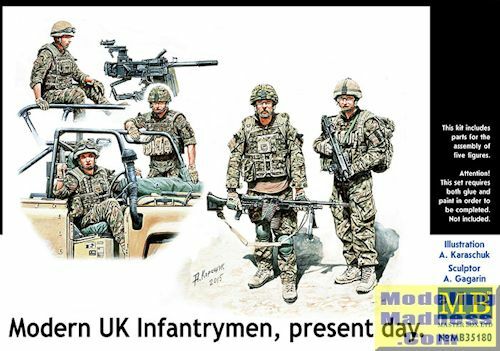 This one contains five modern British soliders, along with all their gear, which is substantial. 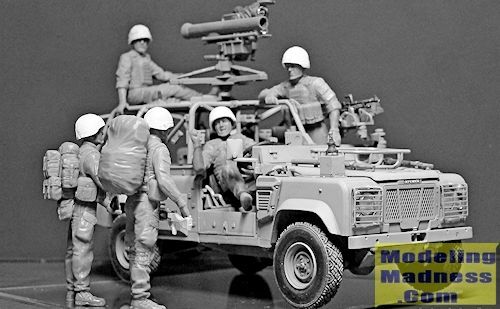 As you can see from the box art and the photo, two of these figures are sitting in or on a Defender so you will need to round up some sort of vehicle to properly display these figures. The Defender is not included in the box. As is the norm with figure sets, there are no assembly instructions per se, but the back of the box shows not only where all the parts go, but also the colors in which they should be painted. Masterbox lists Vallejo and LifeColor paints, though you can use others. Master Box figures are well molded and assemble relatively quickly. They are just the thing for various period dioramas.